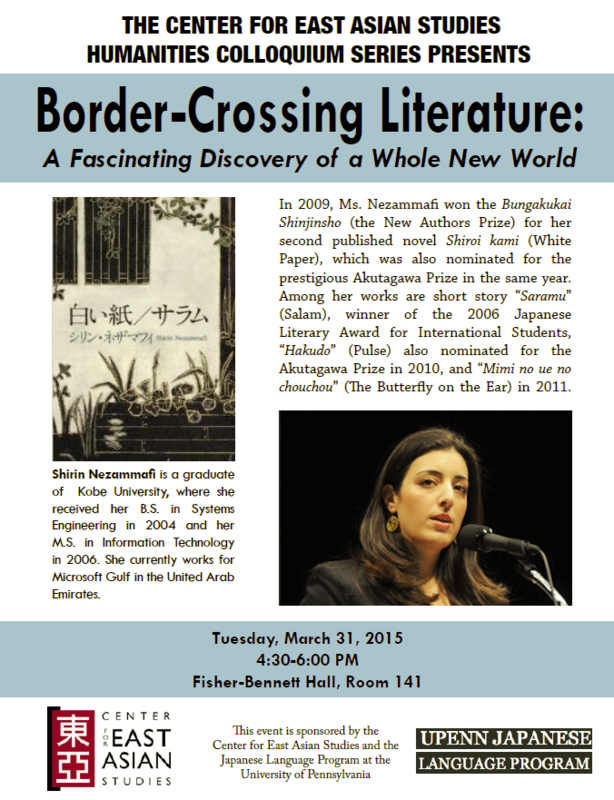 Shirin Nezammafi - "Border-Crossing Literature: A Fascinating Discovery of a Whole New World"
Shirin Nezammafi is a graduate of Kobe University, where she received her B.S. in Systems Engineering in 2004 and her M.S. in Information Technology in 2006. She currently works for Microsoft Gulf in the United Arab Emirates. In 2009, Ms. Nezammafi won the Bungakukai Shinjinsho (the New Authors Prize) for her second published novel Shiroi kami (White Paper), which was also nominated for the prestigious Akutagawa Prize in the same year. Among her works are short story “Saramu” (Salam), winner of the 2006 Japanese Literary Award for International Students, “Hakudo” (Pulse) also nominated for the Akutagawa Prize in 2010, and “Mimi no ue no chouchou” (The Butterfly on the Ear) in 2011.